The Braves and Nationals are thankful for being dealt the Sunday night game. They were forced to stay up past most of our bedtimes due to their 11-inning contest that the Nats won, 4-1. The extra frames weren't the root cause for the game to be pushing 2am on the East Coast when it ended. The 3 hour, 40 minute rain delay was the main culprit before Washington hung a 3-spot in the 11th to claim the victory. So today, after a much-needed rest, the clubs wrap up their weekend series, and I expect Atlanta to return last night's favor as these two battle for NL East supremacy. Bovada's line has the Braves as a slight favorite at -123, and I think that makes the Braves well worth a play here. 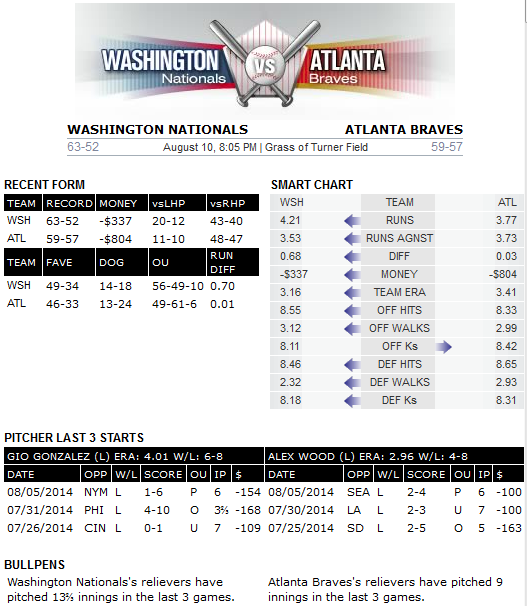 It's a clash of lefties, with Alex Wood (7-9, 3.20 ERA) dealing for Atlanta, while Washington sends Gio Gonzalez (6-8, 4.01 ERA) to the hill. Neither pitcher's record is exactly eye-popping, but Wood has been much better and far more consistent than Gonzalez this season. His two-game-under .500 record is due to a lack of run support and suspect defense behind him -- like his last outing, when he gave up one earned run -- while Gonzalez has mostly himself to blame for his shaky numbers this season. While neither has a win in any if the listed contests, notice Wood is doing a much better job of keeping his team in games and also going deeper into games, which is something needed tonight, too, after last night's extra frames. Going back further, Wood has a 3.40 ERA over his last seven outings. He just doesn't have a lot to show for it in the win column. Washington hits lefties better by average, but Atlanta provides better power numbers against southpaws. I like the Braves' chances to score more much better with Wood's two-games-below .500 record than I do Gonzalez's, and at -123, there's pretty good value to get behind them.